Freyung, Eastern Bavaria, Germany. September 20-21. 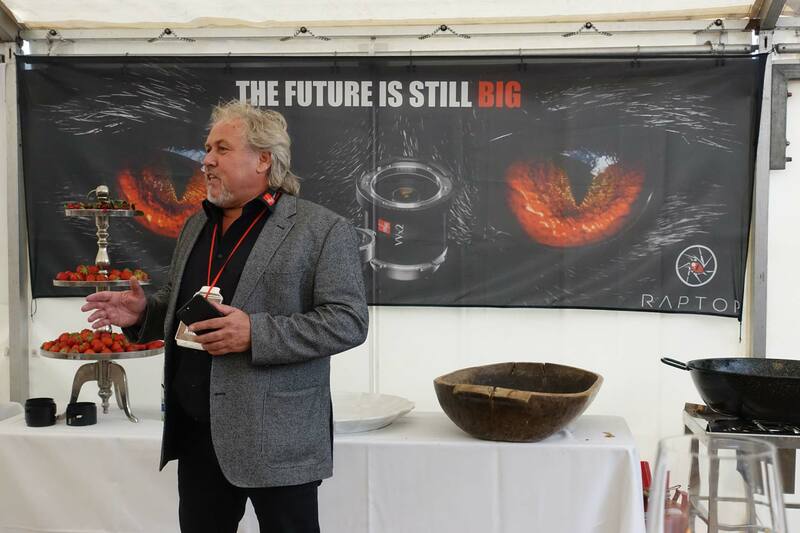 IB/E Optics celebrated their 5th anniversary in Freyung, a town that is close to the Czech border and the Bavarian Forest. It is a hilly region with the largest protected forest in Central Europe. (Previously, IB/E Optics was located in Passau.) Managing Director Klaus Eckerl (above) welcomed several hundred guests who arrived from around the world for tours of the high-tech IB/E facilities. The days and nights were filled with feasts, Bavarian and Cuban music courtesy of the Cuba Boarischen Band, dancing, a giant roast suckling pig, and even bigger pretzels, pancakes and kegs of beer. Since Klaus and company are working extensively in large format lenses, everything was big–including his giant Raptor SUV and the poster proclaiming “The Future is Still Big.” And the future is getting bigger for IB/E: cranes and crews were building a large addition next door to their already impressive optical factory. As seen in the photos that follow, Klaus is a Renaissance man: Optical Wizard, Businessman, Drummer, Guitar Player, Adventurer and terrific host. Click any image to begin slide show. Our 1st Lens day was a wonderful moment to see friends, partners and customers all over the world in our location. My team and me, had the chance to show the scale on our design and production world.